The Titans have made 12 roster moves today, moving their roster to 77 men, the club announced. Tennessee has until 3pm CT Tuesday to get to 75 players. Pitoitua, 31, seemed liked one of the likeliest cuts in the entire NFL. Pitoitua only played 31 defensive snaps last season, but was scheduled to count more than $3.8MM on the Titans’ salary cap. By releasing him, Tennessee will save $3.078MM. Gallik, meanwhile, will revert to the Titans’ injured reserve list if he clears waivers. The 49ers have announced the signing of defensive lineman B.J. McBryde to a two-year contract. McBryde, undrafted out of UConn last year, previously spent time on the practice squads of Philadelphia and Green Bay. The Seahawks have released offensive lineman Lene Maiava and signed receiver Montario Hunter, an undrafted rookie from Division II Elizabeth City State, tweets Bob Condotta of the Seattle Times. The Titans waived undrafted rookie offensive lineman Sam Carlson, leaving them with two open roster spots, as TitanInsider.com’s Terry McCormick tweets. The Titans also signed offensive lineman Ronald Patrick. Patrick has spent time on the practice squads of Dallas, Pittsburgh, Cleveland, and Buffalo but has yet to play in a regular-season game. The Giants have signed two defensive tackles – Jermelle Cudjo and Davon Coleman – and waived receiver Donte Foster and D-tackle Melvin Lewis, per a team announcement. Cudjo appeared in 45 games (four starts) with St. Louis and Detroit from 2010-15. The Bears have signed offensive lineman Dan Buchholz and waived undrafted free agent punter Ben LeCompte, according to Aaron Wilson of the Houston Chronicle and Rich Campbell of the Chicago Tribune (Twitter links). This is already the second stint with the Bears for Buchholz, whom the team signed as an undrafted free agent from Duquesne in May. The Chargers announced the signing of offensive lineman Marcel Jones. The Colts signed tight end Nick Truesdell and waived fellow tight end Mike Miller from the non-football injury list, Mike Chappell of CBS4 tweets. The Falcons have signed receiver Chris King, per D. Orlando Ledbetter of the Atlanta Journal-Constitution (Twitter link). King went undrafted out of Duquesne this year and then spent some time with Arizona. The Giants announced the signing of a quartet of players, including quarterback/wide receiver B.J. Daniels. In addition to the versatile Daniels, the Giants confirmed the addition of wide receivers Kadron Boone and Donte Foster as well as defensive end Ishaq Williams (previously reported). To make room, wide receiver Ben Edwards was waived/injured while linebacker James Morris, quarterback Josh Woodrum, and tight end Cedrick Lang were waived. Daniels has been with the 49ers, Texans, and Seahawks in the last three years. 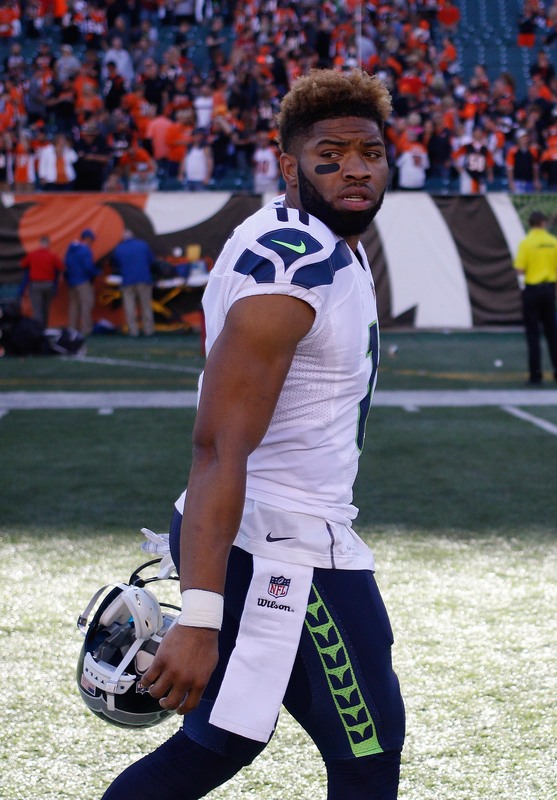 A former seventh-round draft pick of the Niners, Daniels did not appear in a game until last season, when he played in six for the Seahawks and two for the Texans. His final stat line for the year was one completion off of two passes, six rushing attempts for six yards, two receptions for 18 yards, and five punt returns for 25 yards. Williams has not seen live football action since 2013 when he was punished at Notre Dame for alleged academic fraud. In his three seasons for the Fighting Irish, Williams played in 35 games and totaled 45 tackles, six tackles for losses, one sack and one forced fumble. Boone, an LSU product, played in college with Giants wide receiver Odell Beckham Jr. and punter Brad Wing. The Browns have offered a tender to kick returner Raheem Mostert, per his agent Brent Tessler (Twitter link). Mostert, a running back by trade, doesn’t have an NFL carry to his name, but returned 12 kickoffs (25.8 yard average) for Cleveland last season. The Cowboys have cut four players, according to Aaron Wilson of the Houston Chronicle (Twitter link), who reports that the club has parted ways with offensive lineman Cody Clay, receiver Donte Foster, running back Michael Hill, and defensive end Efe Obeda. Of the group, Hill, with eight career games, has the most NFL experience. The Panthers signed linebacker Ben Jacobs, according to the team’s website. An exclusive-rights free agent, the 27-year-old Jacobs spent the past three seasons with the Panthers, suiting up for all 16 games the last two years. The former UDFA out of Fresno State will be a restricted free agent after 2016. The Dolphins signed wide receiver Christion Jones, per SportsTrust Advisors (on Twitter). A former Alabama product who’s yet to suit up in an NFL game, Jones initially caught on with Miami as a rookie last summer but exited via waived/injured designation just before the season began. Jones earned SEC special teams player of the year honors in 2013. Former Towson linebacker Monte Gaddis wants to play for the Browns and he has taken some unusual steps to get their attention, as Zack Meisel of The Plain Dealer writes. Gaddis has been standing outside of the Browns’ complex with a sign with messages such as “Overlooked Cleveland native,” “Starving for my first shot,” and “Why not?” On Wednesday, GM Ray Farmer came outside, speaking with Gaddis and requesting some game film. Now, Gaddis is waiting at home to see if his phone rings with an opportunity to audition for the Browns. As we look forward to seeing if Gaddis’ unusual job application pays dividends, let’s check out some more items from out of the AFC North…. Ravens tight end Dennis Pitta should retire, but his determination won’t let him, writes Jamison Hensley of ESPN.com. Pitta was placed on IR Wednesday, meaning that he will not play a snap in 2015. Still, Pitta is dead set on returning to the field next year, despite his constant hip problems. “I’m a football player and that’s what I’ve always wanted to do,” said Pitta. “I have a sense of duty to my teammates, the team and to this organization. This organization has given me a lot over the last few years.” The tight end has played in only three games since receiving a five-year deal with $16MM guaranteed in February 2014. Despite Pitta’s perseverance, Rob Carlin and Brian Mitchell of CSNMidAtlantic.com (video link) are concerned that the Ravens tight end’s playing days are through. The Bengals worked out quarterback Cody Fajardo, along with wide receivers Donte Foster, Colin Lockett, and DeVier Posey this week, tweets Aaron Wilson of the Houston Chronicle.